The Erasmus MC University Medical Center has a longstanding tradition in fundamental and clinical research in the field of lysosomal storage diseases with a special focus on Pompe disease. The pioneering work of our research group has resulted in the successful implementation of enzyme replacement therapy (ERT) for patients with Pompe disease, turning it into the first treatable hereditary neuromuscular disorder. In 2007, the Center for Lysosomal and Metabolic diseases at Erasmus MC (formerly known as ‘Pompe Center’) was appointed by the Dutch health authority as the Center of Excellence for this particular disease. In this function, the center coordinates the care of all patients combined with basic and clinical research. The research performed at the center is denoted by its translational character, as basic research and clinical research go hand in hand. The studies described in this thesis follow the tradition of combining patient care with translational research. 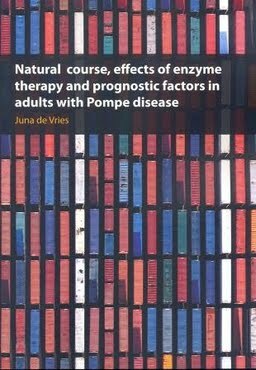 This introductory chapter provides background information on Pompe disease with subjects like: clinical manifestations, natural disease course, diagnosis, pathogenesis, and treatment. The chapter ends with a description of the study aims and the content of the thesis.